How do I organize my course timeline? LearningStone offers a flexible editor to set up a course or coaching track which we call a course timeline. You can organize the course timeline “blocks” (the modules) as a string of events, e.g. a number of classroom events combined with resources, but you can also use it as a list of resources with no time order at all. When you created a workspace two examples were copied into the test groupspace. You can remove course timelines with the “Delete” button in the library of course timelines. To visit the course timeline library, click on More at the top of the timeline and then choosing course timeline library out of the dropdown. How do I add or copy a course timeline? Within the course timeline library you can add, copy or delete course timelines. You can only copy course timelines from groupspaces that you are a manager. EXAMPLES? 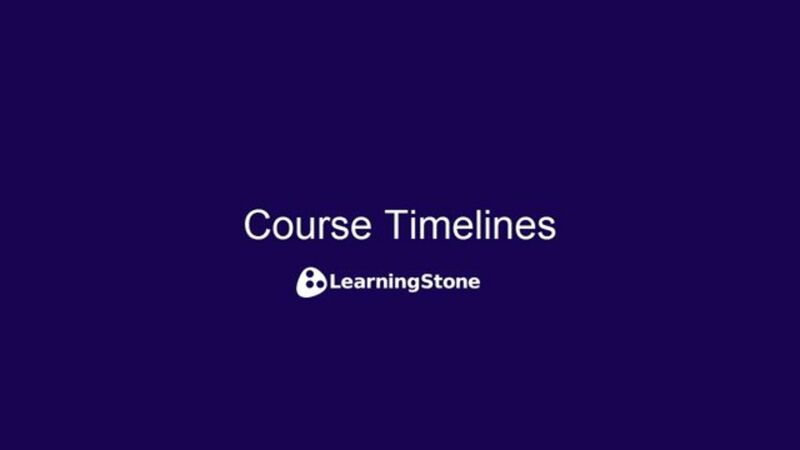 You can find examples of course timelines in the “EXAMPLES” folder which you can find after choosing “Copy or create a new course timeline” in the course timeline library. Can I remove all course timelines? In the course timeline library you can delete course timelines. There’s also the possibility to unpublish any course timeline. If you’d like to have a groupspace without the any course timelines, There’s also the possibility to change the layout of a groupspace to hide the course timelines all together. Go to Settings > Functions and Permissions and choose the option “Wall” (without course timelines). What is a “Default” or “Published” course timeline? In the course timelines library, you will see the default course timeline, which is the course timeline that is shown first on the start page. Other published course timelines are shown in the “More” menu above the default course timeline on the start page. The course timelines that are not published are only visible for coaches and managers. What types of course timeline blocks are there? Just add a block in the Course Editor and choose one of the following to try it out. Click on the icon of the block for some options like changing the icon or color of it. You can also do this with other blocks, but the section has a special “Expand” date range, making it possible to expand the section on a specific date. Text: simple text blocks and images. Event: a calendar item that will show up in the group calendar and trigger notifications each week or daily. Enter an address and click on Geo-data on "Set to entered address" for a map. Please note: if you remove an event block from the course timeline it can take up to 60 seconds to be removed from the calendar. Content: uploads like pdfs, video’s etc., (max 300 Mb. ), linked resources like videos (choose embed URLS for YouTube, Vimeo etc.) or links to external webpages. More about video. Automatic email: Emails that are sent on a specific date to remind the group of something, give between-class assignments etc. If you repeat the message it will be sent the first time at the start date of the course timeline block and will repeat each x days until the end date. So if you repeat the mail every 5 days, and enter the time range 1st of May till the 15th of May, the mail will be sent 3 times (not 4). Assignment: a block for getting assignments sent to an e-mail address with a subject making it easy to organize your e-mail. Forms, surveys, tests, quizzes: a link to one of the forms, surveys, quizzes or tests prepared in with the built in Form application. See “Settings” or the help on forms). Show member: by for example choosing “Coach” here, this block will automatically show the coaches of the groupspace. Certificate Generator: create and send out certificates and diplomas to participants. See help on Certificate Generator. How to I find a block I accidentally deleted? When you add a course timeline block, it is set to “New” by default. You can also choose “Find” to search for an existing block. Choose the category of the block to narrow down the list. How do I add progress markers? Progress markers are points in a course timeline that a participant or coach can click on to tell the coach, trainer or the other groupspace members that a specific block has been seen or understood. You can use progress markers for simple tracking and reporting, for feedback or even for gamification. Click on a block in the editor to view, add or make changes to a progress marker. If the block-type has a progress marker option, you’ll find it at the bottom of the page. How do I schedule content? There are two ways to schedule content. 1. Absolute scheduling: simply set the date of each block and it will appear on that that date. Don’t forget to set the block to published. The disadvantage of this approach is that you have to adjust the data when copying a course timeline. 2. Relative scheduling: Go to the course timeline settings and set the “Start Date” of the course timeline or let the start date be determined by the date the member was added to the groupspace. Go to “Display Options” of any course timeline block which has subblocks (e.g. a section) and add the condition “Days after Start Date” and fill in a number of days. The subblocks will be shown after that number of days (starting at 0:00 AM). (See below “How do I make content conditional?”). How do I make content conditional? This is best explained with a few examples. In all cases, you add a “block” with one or more indented “subblocks”. These subblocks will only be shown when a condition has been met. · x number of days after the starting date has passed. · given a grade higher than 5 out of 10. Step 1. Add a block (e.g. INTRO VIDEO) to a course timeline with a progress marker E.g. “Have you understood this video” (Yes/No). Step 2. Add a second block (e.g. a section called PART 1) with a few indented subblocks. Go to PART 1 and choose Display Options > Condition. Set the condition: “Show subblocks if INTRO VIDEO = Yes” (don’t worry you don’t need to type this!). You can add some feedback for members that haven’t met the condition. If someone answered “No” to the question “Have you understood this video?” they won’t be able to continue with PART 1. You can choose if they can re-do the question and answer “Yes” later. In Step 1 above, you can choose to use the outcome of a quiz or test (any form with multiple-choice questions with a Test pass % set in the form-settings) as a conditional. The form result (passed or not and the %) will automatically be added to the progress report. You’ll find a course timeline explaining conditionals to you in the (English) course timeline Example folder called “Understanding Conditional Content”. How do I change the icons and change the look of a block? Go to the list of blocks. Click on the pen icon next to a block. Then click on “Display options”. Here you can choose out of more than 200 icons, change the color etc. You can also make the block content appear in the course timeline instead of as a side panel. How can I add links to other functions in a course timeline? You can simply copy a URL and paste it into the course timeline to a specific part of LearningStone. This will not work however if you copy your course timeline as the link will point to the wrong group. To solve this, we have developed relative links that you can use in any course timeline. With the following relative links you can point to certain functions in. Please note: these links will not work if sent by email. How do I add video? Add a block, choose the “Content” category, click on “Create” and choose “Embed URL”. You can also upload video right into LearningStone. It will be converted for you to the right format. This can take some time if the video is big. I want a different preview for my uploaded video. If the preview of the video is ugly or simply not what you want, you can add an image to serve as a preview. · Click on the course timeline block. · Click on the title of the video that you uploaded. · Click on “Visit full edit page”. · Add you image as a media item at the bottom. How do I show a trainer / coach / coachee in a course timeline? You can either add a trainer above the course timeline or use the course timeline block called “Show Members”. If you use the “Show Members” block, you can choose which role you will be showing and this will simply show the people of that role (e.g. Coach) for the given course. This saves time when copying a course timeline to another groupspace as you don’t need to update this block. Can I share blocks between course timelines? Yes, if you add a block to a course timeline, you can choose “Find” (instead of creating a new one) and then you can choose a block from any course timeline in the groupspace. If that block is changed, the changes will show up in all course timelines. If one course timeline is deleted, the block will remain connected to the other course timeline. If you want to share blocks across groupspaces, you will need to set the Access Control (in the editor) of the block you want to copy, to “Workspace” instead of “Group”. Warning: if you copy a course timeline with shared blocks, you still make a copy of those blocks (so they are not shared anymore).